For some people, finding the right pet takes lots of searching, but for Mei Wan and her fiancé, it was quick. They entered their search criteria on Petfinder, and Hoppy showed up on the first page of matches. 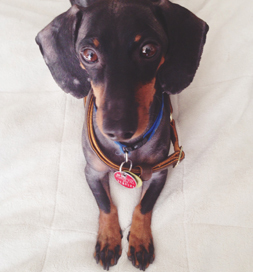 Hoppy’s photo showed a scared, emaciated Dachshund. The picture touched Mei, and she submitted an application to Waggytail Rescue, who had listed him on the website. The New York City rescue is foster-based, meaning they don’t have a bricks-and-mortar facility, so the couple went to a private home to meet the little dog. The foster parent told them that Hoppy was found in Tennessee as a stray. While he was homeless, fleas had taken a toll on him. His body had half-healed scabs and hairless areas from flea bites and allergies to them. He was also very fearful. Then something just short of miraculous happened. The little guy gathered his courage and curiosity, “walked over to my fiancé, jumped on the couch where we were sitting and fell asleep on his lap,” Mei recalls. It was no surprise that this gesture of trust won their hearts completely. Mei says he has gained a few pounds since they adopted him and no longer looks emaciated. And, although he is still afraid of strangers, he no longer runs away from them. Love and TLC are transforming Hoppy into happy.